Fee: Yes, 20, per night Number of pets per room: 2 Weight Limit: 70 pounds Allow pets in all rooms: Specific Block of rooms, 6 Policy on attending to the pet: Pet can be left unattended in room if CAGED. Cleaning fee: No, hotel does not charge a cleaning fee Others: Green Space for Walking. 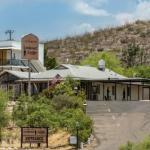 Located 2-minutes from Tombstone, Arizona city centre on Route 80, this hotel offers a daily full hot breakfast on-site to guests at the Ranch 22 restaurant. Free Wi-Fi is available in all rooms at the hotel. A satellite TV, a refrigerator and a work desk with chairs are included in all rooms at the Landmark Lookout Lodge. Each room is individually temperature controlled. A seasonal pool and outdoor fire pits are featured at the Tombstone Landmark Lookout Lodge. Old West historic sites are nearby the hotel. The OK Corral is 0.9-miles away, while the Crystal Palace Saloon is a 2-minute drive away. Boothill Graveyard is an 8-minute walk from the hotel..
We plan to add more related stuff like: pet friendly hotels in Tombstone, Arizona dog friendly hotels in Tombstone, dog parks in Tombstone, pet stores in Tombstone, AZ, and pet spas in Tombstone. Keep checking for more!